The King of Cups is the calm sense of clarity that washes over you when things are heating up. Like a seasoned mariner, the King knows how to steer his vessel safely through the roughest seas. Note how the King of Cups’ crown, the symbol of his authority, reaches above the back of the throne. This shows it’s he who is in control! It’s this control that allows the King of Cups to do the seemingly impossible – such as keeping his heavy granite throne from sinking to the bottom of the ocean. The cup in his right hand and his blue robe symbolize his association with the element of water. The red and yellow cloak represents fire and air. In fact, the King of Cups is the fire aspect of water. Like in the Ten of Cups – but on a much more dramatic scale – fire energizes the immense emotional and intuitive potential of water. 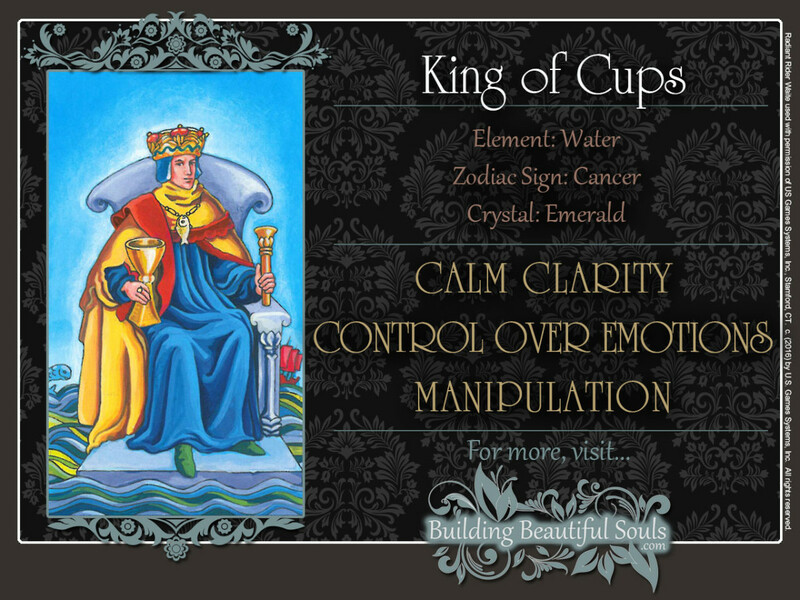 Astrologically, the King of Cups tarot card combines the imagination and creativity of airy (yellow) Aquarius with the receptive intuitiveness of Pisces. It’s hard to imagine a better astrological match than Pisces and Aquarius. It allows the King of Cups to control this turbulent element, instead of being consumed by it. The King’s armored foot extends over the stone platform without touching the water below. This reinforces the idea that he controls the waters without being affected by them. Note that the King of Cups’ scepter is in the shape of a lotus flower. This means that he has mastered the art of manifesting the creative potential of his subconscious mind. The dolphin and the red ship on the King of Cups tarot card show that his power can be used to create and destroy. It’s no wonder people admire you! You’re calm under pressure, you know how to motivate people, and you have an intuitive sense of what’s fair. Your creative intelligence gives you a rare talent for problem solving. To you, a disaster in the making is often a minor problem with an easy fix. For example, your roommate may have mistaken the stove top for extra counter space, and the coffee maker has just burst into flame. Instead of wasting precious minutes getting upset or trying to find 911 in the phone book, you calmly grab the extinguisher and put out the fire. You can keep a cool head during the most intense crisis situations, because you act from your emotional center. It’s pretty hard to knock you off balance. Having a sound understanding of your own emotions allows you to connect with others more easily. Instead of bossing them around, you have learned that showing what’s in it for them is a much better motivator. Of course, the King of Cups is a great card in a reading about love. If you already are in a relationship, you and your significant other are in a solid partnership that will weather the worst storms. If you are still single, you will soon enter the state of emotional stability that will allow you to attract the right partner. 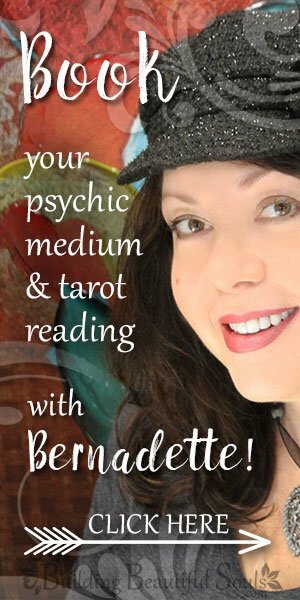 The King of Cups tarot card spells good news in business. There’s an atmosphere of goodwill and trust on all sides. Let everyone bring their creative ideas to the table, and you can work out a deal where everyone wins. It’s the perfect card for starting a new venture, but also weathering a crisis or disagreement between partners. Due to the fluid energy of the suit of cups, this crisis will pass as long as you can keep a cool head. Hamlet mused, “Something is rotten in the state of Denmark.” He may be right. When reversed, the King of Cups’ fiery aspect has turned the waters around you into a churning chaos. In this emotional turmoil, it’s not likely that you will be able to see clearly. Someone close to you may try to drag you into his or her personal drama. For example, if friends of yours are having relationship problems, they may ask you to choose sides. You know very well that’s a bad idea! Chances are, they’ll sort things out sooner or later, and then both will resent you – because you did exactly what they asked you to. Setting loving, but firm boundaries will save you a major headache later. When reversed, the King of Cups tarot card may also remind you that in a loving relationship, it’s not healthy to depend on your partner for meeting all your emotional needs. It may show that you have a false idea of love. This can manifest in jealousy and possessiveness and if not checked, it can escalate into an emotionally abusive situation. The overpowering emotional energy in this card can be very disorienting. This may leave you especially vulnerable to unscrupulous individuals who don’t have your best interest at heart. In this aspect, the reversed King of Cups is like the reversed Knight – but on steroids! The good news is that since he’s not all that subtle, he is pretty easy to spot. Your gut feelings will give you important insights. Trust them. The King of Cups may be smiling, but his eyes are constantly scanning you, trying to find chinks in your armor. When he speaks, he is always fishing for an angle. Or there is something else about him that will make you feel a little uneasy. Still, it’s a good idea to delay important decisions, if you can, especially if these decisions involve substantial financial or emotional commitments. Do your homework before signing any papers. For example, that used car in the dealership may sparkle in the sun. It may even kitten during the test drive. But that’s no guarantee that the head gasket won’t blow on your way home. Having your mechanic take a look under the hood can’t hurt. Kings are associated with the Number 2. Kabbalistically, that’s the sphere of the zodiac, the great cosmic wheel on which the threads of fate are spun. In traditional numerology, this number corresponds to the intuitive creativity of the moon. In the Suit of Cups, these energies combine to reinforce the King of Cups card’s message of emotional balance.